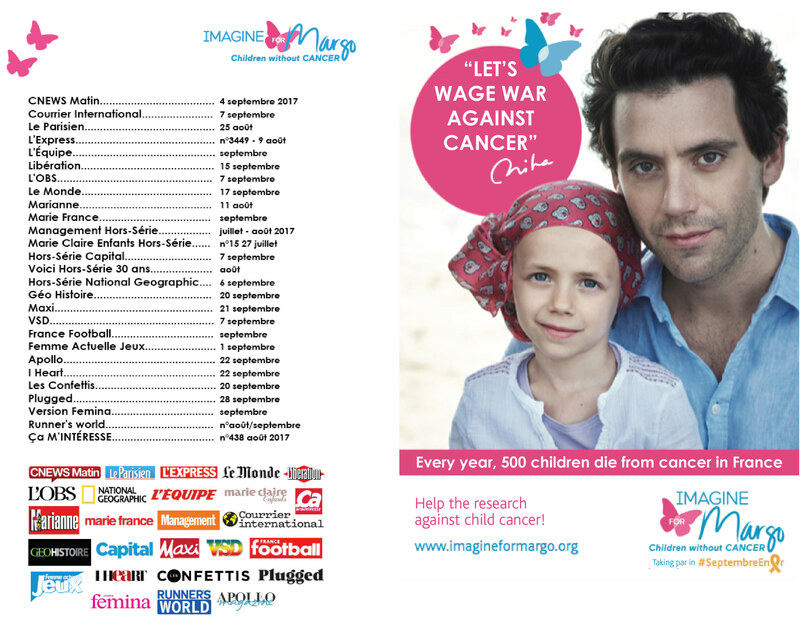 For the fourth consecutive year, Imagine for Margo launches a national awareness campaign on childhood cancer throughout the month of September 2017, thanks to the tremendous generosity of photographer Peter Lindbergh, Stephen Kidd, the creative and media agencies Mindshare, Zorba, Reuilly&Associés, DaisyDay and many media supports. All the media have, once again, answered positive to our demand, touche by our cause as well : television, outdoor, print and digital. We benefit this year from an even stronger media plan which will allow us to make millions of people aware of the cause of childhood cancer. OUTDOOR POSTERS AND PRESS The campaign uses one of the splendid works by photographer Peter Lindbergh, created during our trip with singer Mika in the Camargue region (France) Outdoor posters : more than 4 500 posters in France, during september JC Decaux (Paris, with Champs Elysées & others regions) : from the 21th til the 27th of august Exterion (parisian ring road) : from the 21th til the 27th of august Mediagares (big parisian stations) : from the 28th of august til the 3rd of september, then, from the 18th til the 24th of september ClearChannel (Paris & others regions): from the 4th til the 24th of september Insert (Paris & others regions): from the 4th til the 10th of september then, from the 25th of september til the 1st of october A huge THANK YOU to JC Decaux, ClearChannel, Mediagares, Insert and Exterion to offer us this exceptional outdoor This year again, a lot of magazines are supporting our cause by offering us free publications in August and September. There is one for everyone’s taste ! If you like specialized print or more general topics, you will surely see us anyway. If it is the case, share about it using our hashtags. Press : a lot of magazines are supporting our cause. Find here the complete calendar of publications to complete your readings! TELEVISION AND INTERNET Watching those two little warriors playing together is so moving. Children with cancer remain children anyway, even when facing the disease. Their smiles while they are fighting daily against cancer is very touching, as if it was a happy interlude full of carelessness… A big thank you to Stephen Kidd for these beautiful images, to Maya and Djibril for their good spirit and their talent, to Christian and Elsa Reuilly for the script. 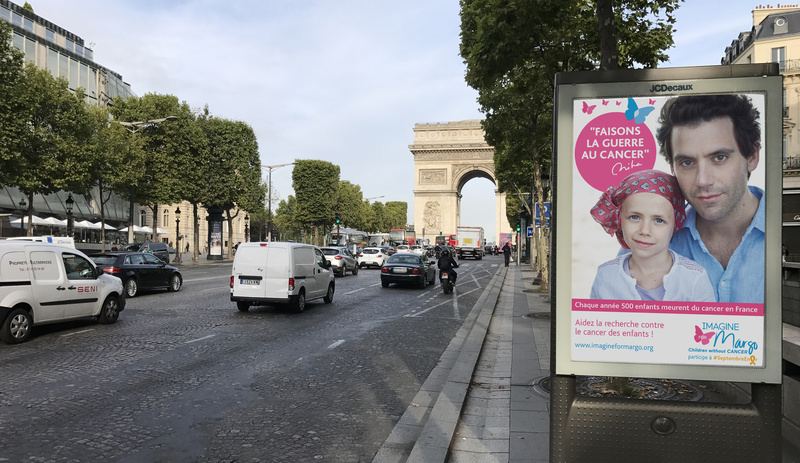 Television : More than 150 Tv spots planned to raise awareness French people about the child cancer.A big thank you to the télévision channels that air our movie : TF1, France 2, France 3, France 5, CStar, France Ô, Canal + Sport, CNEWS, Infosport +, RFM TV, Comédie +, Planète A&E et Elle Girl. Digital : More than 2 Mmillions of french people will be made aware of our cause on the internet. Thank you to all the advertisers that allow our campaign to be broadcasted on the internet this year again : M6 Publicité, Dailymotion, BFMTV, Au Féminin and more. ACKNOWLEDGEMENT A BIG THANK YOU to Reuilly&Associés, Zorba, DaisyDay and Mindshare, big hearted agencies which worked non-stop for this campaign to be seen everywhere in France on all media supports. THANK YOU as well to all the media which generously and loyally give us free space.